New information has been released regarding a single-vehicle wreck that occurred near Menlo on December 29th. 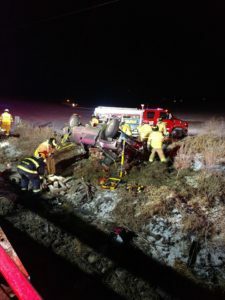 According to the Guthrie County Sheriff’s Office, 49-year-old Matthew Don Farber of Panora was driving a Chevy Silverado northbound on Ranch Trail near White Pole Road when the rollover incident occurred at approximately 8 p.m. Stuart Fire and Rescue and Menlo Fire and Rescue responded at about 10:30 p.m. to extricate both Farber and his passenger, 33-year-old Kelly Pierce also of Panora, from the vehicle. Farber was transported by Menlo EMS to Mercy Medical Center and Pierce was airlifted by Mercy One to Mercy Medical Center. The report shows the truck was a total loss, there was $300 in damages done to a fence line and another $10,000 in damages done to a bridge. Farber has been cited for failure to maintain control and for a violation of a stop sign. Other charges are pending completion of the investigation. Raccoon Valley Radio will bring you more information as it becomes official.